Rajo Devi is 75. Her daughter and first-born child, Naveen, is five. In India the average woman lives to 68 - Rajo Devi says she was fortunate to become a mother at 70. There is no way to confirm Rajo Devi's age: births are rarely registered in rural India and many people are often unsure of their own age. The world's oldest "verified" mother is Maria del Carmen Bousada de Lara, who died in 2009. Naveen was conceived through IVF (in-vitro fertilisation) at a clinic near her village in the northern state of Haryana. Like most children, she's sometimes naughty and seeks attention. But unlike other mothers, it's hard for Rajo Devi to do the running around - old age has taken its toll. First it was the fatigue of childbirth, then an ovarian cyst, followed by an intestinal disease. Dr Allan Pacey from UK's Sheffield University says it is "certainly possibly for women in their 70s to become pregnant if IVF donor eggs from a younger woman are used". "But there are dangers to the health of the mother and the baby." So, why did Rajo Devi risk motherhood at her age? "It was very important," she says. Media captionEmbryologist Jane Blower: "It is a very difficult situation to put a parent in"
Motherhood is revered in India - the country is likened to a mother and is even called "Mother India". And a woman unable to produce a child, especially in rural India, is often referred to as "infertile" and enjoys little respect. Multiple marriages, though illegal, provide a way to circumvent this inability of having a biological child. And then there is the issue of inheritance. In fact, Bala Ram says that is the only reason they agreed to undergo IVF at their old age. "If we were to die without an heir, all our assets would be usurped by my brothers or neighbours," he says. Bala Ram owns around 10 acres of fertile land and two buffaloes. He grows rice, wheat, cotton and mustard through the year, earning around $5,000 (£3,000) annually. Of course, the couple wanted a male child who would inherit the property and carry the family name forward, whereas a daughter would marry and live with her husband. But Bala Ram had few choices. "Once our daughter was born, the doctor told us that Rajo Devi was too frail to undergo IVF and childbirth again, so for us, Naveen is our daughter and our son." The process of IVF involves using the sperm of the man to fertilise the egg produced by his wife outside her body in a petri-dish. The resulting embryo is then planted back into the woman's uterus and she carries it to term. In this case, though, by the time the family discovered IVF, Rajo Devi and her sister were both past their menopause and neither could produce eggs. Rajo Devi's sister was not found fit enough to carry an embryo, and it finally fell on the older sister to go through the process. For all this persistence for a biological child, it was a minor detail that the egg that fertilised Bala Ram's sperm belonged to an unknown woman donor. They claim not to understand this aspect and couldn't care less. "It's a happy family now," Rajo Devi says. "The villagers treat us differently and even when I am gone, my sister will bring up my child." Dr Anurag Bishnoi runs a clinic in Haryana where he says he now treats about 1,000 women every year - "a third are aged between 50 and 70 years". Bhateri Devi was 64 when she started her treatment with Dr Bishnoi in 2010. She delivered triplets: two daughters and a son. One daughter died after a few weeks. The other children are now going to school. 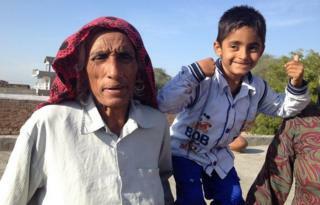 Bhateri Devi has a long day: three-year-olds are a handful and she walks them to school and back. She and her husband Deva Singh live a few miles away from the clinic and their experience sounds like a re-run of what Rajo Devi had shared with me. "We were called childless, and no one would like to see our faces in the morning. They feared it would spoil their fortune in bearing children," says Deva Singh. Bhateri Devi's frame has shrunk as much as Rajo Devi's. For both, late childbirth has clearly taken its toll, but neither admits this. "In any case, the body of a woman is meant for childbirth and irrespective of age, that is never easy," Bhateri Devi says. Rajo Devi goes much further. "It is a man's world after all, and here, women don't have any choices."